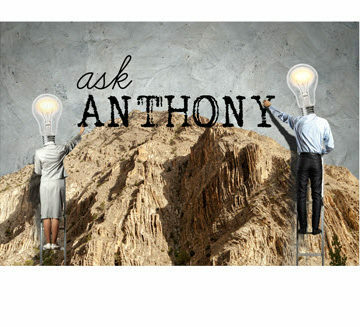 Ask Anthony: How Do I Get Enough Design Experience for My P.E. License If I Work in Construction? Civil engineers working in construction often ask this question. There is not a catch-all answer here, but the short answer is you must be persistent in finding ways to do design work in your job. The reason this is a tricky question to answer is that professional engineering license experience requirements differ in every state. That being said, I will focus my answer on how to implement design experience into a construction engineering position. First let me say that, while I have never worked for a general contractor as a civil engineer, I have worked on projects where my company served as the construction management representative. Secondly, my wife, who is also a civil engineer, focused in geotechnical engineering, has worked for a contractor and spent many years on constructions sites. And no, we don’t sit around the house and talk about civil engineering all day – only a few hours a day. 1. Volunteer to work with the design engineer of record as often as possible on your projects. Often there will be a design engineer who has the responsibility of ensuring that projects are constructed according to plans and specifications. If you can work with that engineer on tasks related to the design – like shop drawing preparation, design-related meetings, and other design-related tasks – you might be able to get credit for design experience on these tasks. In some states, the design engineer, even though not at the same company as yours, may be permitted to sign off on this experience for you. 2. Gain design experience through volunteer work. I know an engineer who volunteered for a wonderful organization called Engineers Without Borders, who helped designed a water treatment system for a community in a developing country. 3. Consider taking a side job for a small sole-proprietor civil engineer. If your company allows, consider taking on a part-time position with a very small one-person civil engineering company. Doing so can give you 5-10 hours of design experience per week and a chance to work with a P.E. one-on-one. This can be a win-win, because often sole proprietors can’t commit to a full-time employee so a flexible arrangement like this works well for them, and of course you will get the much-needed design experience. These are just a few ideas for gaining design experience as a civil engineer in a construction company. I would love to hear additional ideas or experiences in the comments below from those who have gone through this process. DISCLAIMER: Please note that every U.S. state has different guidelines on what they deem design experience, so be sure that before you take action in your career, you are clear about your local guidelines. Lastly, let me urge you to never accept the idea that you can’t gain design experience or sit for the P.E. exam if you work in construction; it’s just not true. Be persistent and find ways to gain experience and obtain your P.E. license. Your civil engineering career will be better for it. 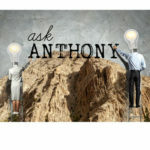 Anthony Fasano, P.E., is the founder of The Engineering Career Coach website, which has helped thousands of engineers develop their business and leadership skills. He hosts The Civil Engineering Podcast, and has written a bestselling book for engineers entitled Engineer Your Own Success. You can download a free video series on his website that will give you the tools needed to immediately improve your networking and communication skills by clicking here. 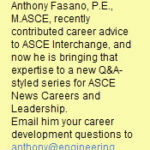 Ask Anthony: How Do I Return to a Civil Engineering Discipline After a Hiatus? I actually was co-op with 4th largest design-builder in world (CBI), and this allowed exposure to design office as well as field engineering. Plus, the experience gained working on all of the elevated structures we did helped qualify me for the GC here in Florida, which requires a year of experience working over 60-feet above ground. But then, I found the design experience that inevitably comes from putting things together, changing or sometimes moving them, actually can sometimes be at higher level than mere office design; it’s a shame that the engineering boards frequently do not consider this work as qualifying experience. In fact, I’ll go so far as to say that it sometimes takes a good builder to pull some of the designs I’ve seen out of the proverbial hat! Builders are just such an amazing part of the successful design-build team, and all of this actually sits at the root and heart of our civil engineering heritage. David W. Johnston, P.E, Ph.D. I am P.E. who mentors engineers-in-training and recent graduates from civil engineering and construction education programs. My educational background is in the construction engineering and management specialty of the civil engineering profession. I advised these prospective engineers in the construction engineering and management specialty that they may fulfill the “qualifying experience in engineering work” requirement of the P.E. license in the State of California through the following construction engineering tasks: (1) Earthwork Construction, (2) Estimating Quantities and Costs, (3) Construction Operations and Methods, (4) Scheduling, (5) Material Quality Control and Production, (6) Temporary Structures, and (7) Health and Safety. Qualifying experience in engineering work may be obtained in construction and construction management firms and not just through a design firm. John, thank you for this great advice! I am about to graduate from a California state college with a B.S. in Civil Engineering and am passionate about construction. I was worried about how time spent working in construction might impact my plans to get my P.E. license. Now I know what I need to get experience in to make this happen. I appreciate the advice! I qualified for the PE exam in Virginia while working for the Army Corps of Engineers. I was a contract administrator overseeing construction on a military facility. I did not think that I would qualify for the test because for the most part, my duties were reviewing submitals and performing field inspections. I did read somewhere that ensuring that construction confirms to the contract requirements and by extension, design requirements, meets the engineering experience required to sit for the exam. I was drafted during the Korean War, and spent nearly four years as an officer in the Navy Civil Engineer Corps, as a company commander in the Navy’s SeaBees. This experience was extremely valuable as I worked for the remainder of my career in a design consulting firm. A young engineer would do well to consider such a career investment to see the world while gaining field experience and serving his/her country. Working a second job could be construed as moonlighting. This arrangement should be approved by both employers to avoid legal and ethical questions. Matt – good approach, I think transparency like this is always good in all endeavors! I find it ironic that the civil engineering community and the registration boards typically discount construction experience. I have worn both hats. And fortunately, I obtained my professional registration during my career working for a geotechnical consulting firm. Now, I’m a contractor and I use my engineering skills every day – whether for designing temporary facilities or related to the construction aspects of the permanent work. I employ some young EITs and I believe that their work under me is as valuable towards a PE as most other junior engineers at design firms, perhaps even better. I can tell you that friends of my EITs that are working for design firms are envious of the engineering work and experience my guys get. Obviously not all construction positions provide an acceptable level of experience for the PE, and I understand that. – Each case should be evaluated on its own merits. Why would an inspection engineer have more meritorious experience than the contractor-employed engineer actually doing the work being inspected? – All qualifying work should be under the direct, or indirect, supervision of a PE. If the construction engineer prepares submittals that are reviewed by a PE working for the owner, then why shouldn’t that count? I started my engineering career in construction and obtained my PE license in NY. In addition to the above, I would recommend young engineers take a proactive role in educating themselves every day while working In construction. All projects require submittals in the form of data sheets and shop drawings, and engineering calculations. Seek out this information to review and learn the design process behind the drawings. Use these submittals to both – do your daily work and understand all aspects of a particular days installation. For example, if installing a column or footing seek out the calculations and review the factor of safety and back into the numbers so you get a feel for the design process. Also for smaller projects, study catalog cut sheets and ask the designer or Resident Engineer questions as to why that particular product was chosen. These type of actions will open the “design world” to you and I guarantee it will help you on the PE exam and more importantly it will make you a better engineer. If you have specific questions related to your situation or just want career advise you may email me at reno7777@msn.com. Regards. Reno great advice and so kind of you to share your contact information. I may reach out to you myself. IMHO, we have this backwards. The object of what we do is to build infrastructure. What we as designers need is more in the field construction experience to learn first hand how stuff is built in the field. It seems that too many of our registration regulations were designed by academics with no actual construction experience, what we ought to be doing is requiring at least two years of experience in the field as a construction engineer as a prerequisite for registration. I agree strongly. Two years may not even be enough. Earlier in my career I was shocked to find out the construction managers (with only a construction management BS) were able to sit for the PE. They may not have taken design classes and if so they were they may have been geared to construction engineers. Getting design experience through the Engineer of Record while working on RFI’s during construction is a poor excuse for design experience. It would take a very long time to accumulate the 4 years of design experience required to sit for the PE this way. Too many engineers are too quick to sign off on this experience. If seen too many engineers and construction engineers sit for the exam without enough of any design experience. The whole process has to be tightened up. Tom – you’re right in that it shouldn’t be a substitute for all design experience, it should only supplement it. At least, that’s what I think. A simpler way to registration may apply to some individuals who choose to first work a few years in design, understand that side of the business, and then go into construction, which to me, can be more interesting, and the design background will never hurt your knowledge and experience. Working for an EPC company might be a solution that doesn’t require changing jobs. Good thought Jim, I wonder if companies would be willing to take that approach with their staff as they typically send the youngest engineers into the field. If you are on the construction side of Civil Engineering, you will be working with a design engineer to implement his design in the field. Often, these designs are not perfect and RFI’s will come from the contractor asking for solutions to modify designs for field conditions or changes. I recommend that you establish a relationship with the design engineer and explain your goal of getting your license. You can meet regularly with that engineer during the course of your project and take part in the designs that are created. At the end of your project, the Design Engineer should be confident enough in your skill set to sign off on that part of your application. Matt, I remember while still working in field as a field engineer, project engineer and general superintendent, how I frequently came across so much stuff that was not shown in the plans, or not mentioned in the specs, or was shown wrong or contradicted itself in one place or the other, and yet we still “had to build it”. At greatest extreme, I’ve field designed foundations and equipment supports where designers did not show anything on plans, and when called informed me how that was “delegated work”. No problem, as Bob the Builder can sure fix it! Alas, I thought I hit a bit of too much an extreme when they forced us to move features (say a building here, or tanks there…) that conflicted other items. For a while early in my career it got to point where I right enjoyed correcting the things that others had painfully screwed up in their engineering and architectural plans. Why? Because the art of detailing is not taught within our engineering schools anymore. This is an area where emphasis needs to be placed.